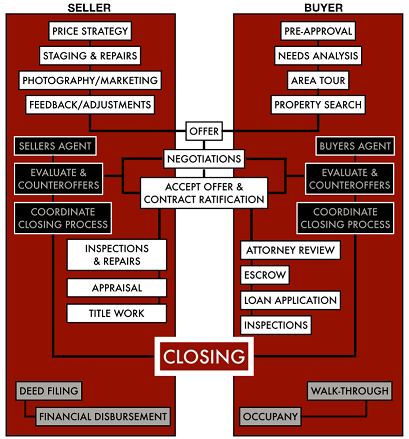 The process of selling your home. If you’re planning on selling your home, especially for the first time, you might have questions about the selling process such as: How does the whole process start? What are my next steps after beginning a home sale? What do I need to look out for as a home seller? If you’ve got a dedicated Realtor® on your side, you won’t feel alone during the sale of your home, but it’s a good idea to learn about the basic selling process before beginning in order to start with an eased mind. Before you list your home for sale, you must first get it ready for the market. This includes coming up with a reasonable asking price for your home, staging and repairs that need to be completed, appraisals, having marketing photographs taken, and adjusting your strategy with your agent. With the help of your Realtor®, you can rest assured that only people who have been pre-approved for a mortgage loan will be viewing your home. Once the offer is made, your agent and the buyer’s agent will engage in discussing negotiations and counter-offers. Once a counter-offer is accepted, a contract is written up and the closing process begins. During this part of the selling process, your home will undergo inspections and repairs, an appraisal, and the title will be written. The buyer will be responsible for having their attorney review all of the paperwork in the contract, seeing to the finishing touches in their mortgage loan, and then the escrow account will be closed once the sale of the home is complete. When you’re ready to buy or sell a home in the Washington DC Metro Market, you want a Realtor® you can trust, whose experience will help you buy a property with confidence. Jared Associates stands ready to help you achieve your home dreams. Give me a call, Jared Russell, at 301-351-7711 (mobile), or 240-383-1350 (office) or email me at jaredr@kw.com. You can also visit me at my website for additional information.